I am currently in Spokane, WA speaking at Whitworth University, and had some time yesterday afternoon to walk around the city and grab some photos. Since I am staying along the river, I started my 10 mile walk on the riverside. This was one of the first views I saw, with the great colors in the trees, and the dramatic cloudy sky. I walked to the main falls and took this photo. I liked the composition, but thought that this would make an even better night shot. After walking along the river, I went to Manito Park. Most of the park was without color, since it is the wrong time of year for their blooms. Within the park, they have a Japanese garden, which had great fall colors. I got down low for this photo, to show the colorful leaves on the ground. There was one tree in particular that was in full red color, and I moved to many positions to get these two photos. My goal was to get the red leaves in front of a complimentary colored background. Even though my feet were tired from walking all afternoon, I could not resist the temptation to walk back to my original river location to get this night shot. I waited in this spot for an hour to get the perfect deep blue skies. I had my Canon 5D Mark IV and Canon 24-105mm lens mounted on my Gitzo travel tripod and Acratech ball head. Unlike the day shot that was taken with a fast shutter speed, this night photo was taken with a 15 second exposure. The long exposure blurs the water perfectly and adds to the drama of the photo. Compare this night shot to the day shot, and I think you'll agree that this one is much more interesting. 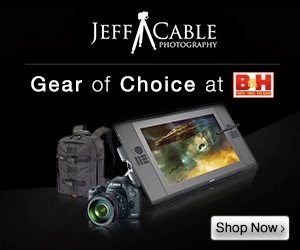 Subscribe to the Jeff Cable Photography Blog by clicking HERE! Check out my upcoming photo tours to amazing places around the world. I have photo tours to Africa, Costa Rica, Europe, Asia, India and more. And Canon will loan you any gear you want for FREE for any of my tours. The night shot is really neat. I love the deep blue colours in the sky. Way more interesting than your day shot, for sure. Congratulations on not being lazy and getting back! ahahaha!